Video marketing has quickly become one of the most popular forms of online media, however for many ecommerce businesses it is yet to secure itself as a must have part of the marketing strategy. This is in a great part due to the misconception about it not being possible to gauge the ROI on video marketing. When you consider SEO & PPC agencies or conversion rate experts, they have had many years to be able to show clients how they can measure their results. An SEO consultant or agency can clearly show you where you rank prior to any SEO work being carried out, compared to after an SEO campaign. They can show the increase in organic traffic to certain pages and explain how this is because of keywords associated with the given page having increased in the Google results. As well as this, they can also show you the traffic generated from acquiring links on other websites and explain that these links directly help your site rank better in Google. PPC consultants have an easier time in showing their value, as they can clearly display the number of sales or leads they have generated and the costs accrued in achieving this. Video marketing is typically measured by the number of views the video generated (on YouTube), video retention time, subscribers, likes, dislikes and referral traffic to the client’s website. What a lot of ecommerce companies are not actually considering however, is the conversion rate, reduced bounce rate and increased time spent on the site when a specific video is embedded on a page. When video marketing is used to increase the value of any given page, it quite quickly becomes obvious what the true value of the video content is. Google rewards web pages that show signs of providing value to a visitor and there are ways in which this is calculated by Google. When a webpage does not keep a visitor on it for long, this impacts the ability of that page in terms of rankings in Google. If a site has a high “bounce rate”, meaning a high percentage of people leaving the site without visiting another page on the site, the website will find it more difficult to rank well in Google. These are known as retention metrics and are indicators of the quality of a given webpage. All of this data can be accessed if the client has Google Analytics or another reputable analytics system installed on the site. If you think about a webpage that engages its visitors and gets them absorbing more and more information, this is surely better than a page people leave after a few moments, right? So when video is embedded on a given page and it gives the visitor everything they need to solve a problem or explain a service or product they are interested in, then this is valuable to a visitor and actually helps the SEO of the page. This also assists PPC, as visitors could be directed from the adwords ad to a specific page that utilises video to concisely educate the visitor towards the call to action, be it an opt-in form for data capture or sale/lead. Ultimately, the conversion rate of the page (the percentage of visitors that take the desired action) can increase when video is used to enhance the value for the visitor. To address the goal of generating video views, an ecommerce business must see the difference between a sales-focused video and a video that solves a prospective customer’s problem. Below is an example of a fishing tackle company called Korda, producing a video that discusses the use of artificial baits in course fishing. Part of the reason why this video is effective is that it goes deeper than just showing off the product and telling you to purchase it from the website. This video discusses the time to use these types of “rigs”, how to set them up and even shows the rig being used to great success. Korda could have tapped into a larger market by purposely targeting a query such as “how to use fake baits” or “how to catch carp with fake corn” with the title of the video and the video description. You can see how another UK based fishing expert (Carl and Alex Fishing) have directly addressed a prospective customer’s query with their video below and reaped the benefits of almost 80,000 views so far. If we continue on the topic of course fishing and how ecommerce sites in this industry could best tackle video marketing, we should first consider the problem-solving role video can play. There are many times when video is truly the best medium for solving a problem, and many fishing related topics are best addressed with video as it is hard to properly solve the problem with text alone. It cannot only clearly show how to solve the problem and bypass a written explanation (as the primary content medium), but also inspire the viewer and create a connection between the viewer and the brand. When a brand like Korda look at their range of products, they should begin by taking one category of products that is significant and considering all of the common questions surrounding the product and where it fits in within the sport. For example, this product category “Fake Food” will have a whole range of potential content ideas that it is already, or could be connected to. 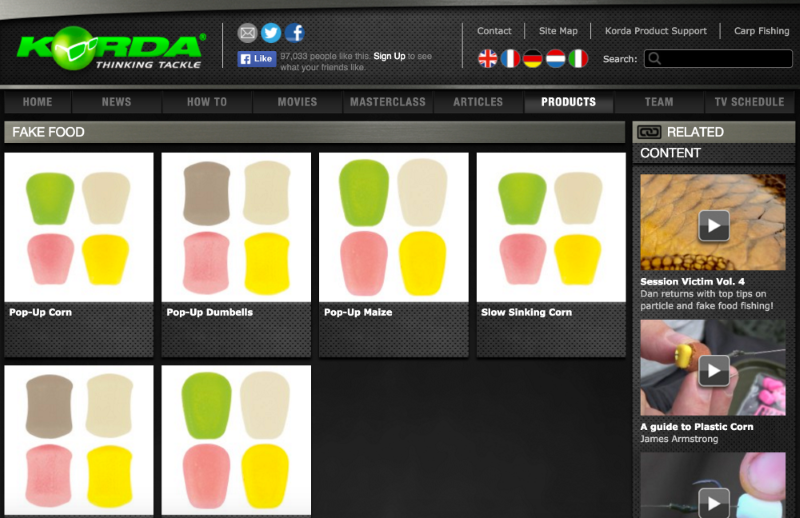 If Korda select the first product in the category, “Pop-up corn” and search in YouTube for “how to use pop up corn“, they are presented with a variety of videos all tackling slightly different aspects of the use of pop-up corn. common queries related to the video, it could give a clear indicator of some content angles to address through the video you are planning. As well as this, the comments can often shed light on the demand for specific products. 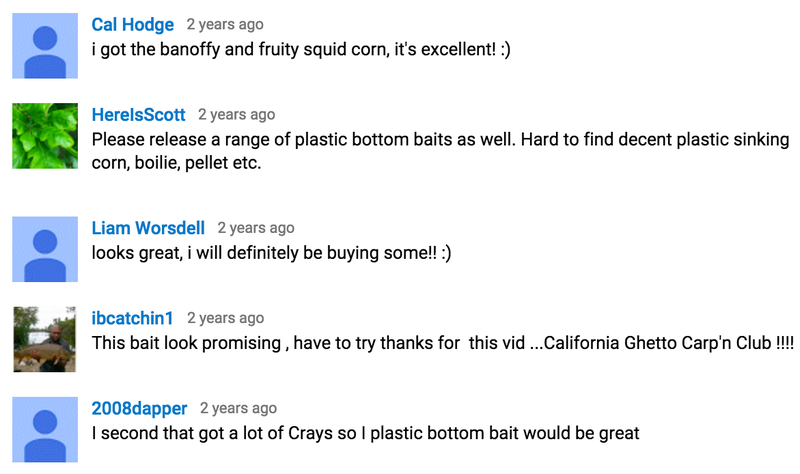 These comments shown below are all in response to Korda’s “Fake Baits” video and show a clear demand for “plastic bottom baits”. Korda could also target searchers who are higher in the funnel, meaning they may not be aware that pop-up corn is the the product they need. They could do this by addressing a topic such as “boilie alternatives” or “how to catch carp in the winter” and make use of the pop-up corn as the bait that catches the carp. Of course, this is just one product and we already have a stream of potential ideas. When this process is carried out across multiple products the video strategy soon addressing masses of potential problems/interests that anglers (fishing enthusiasts) have. 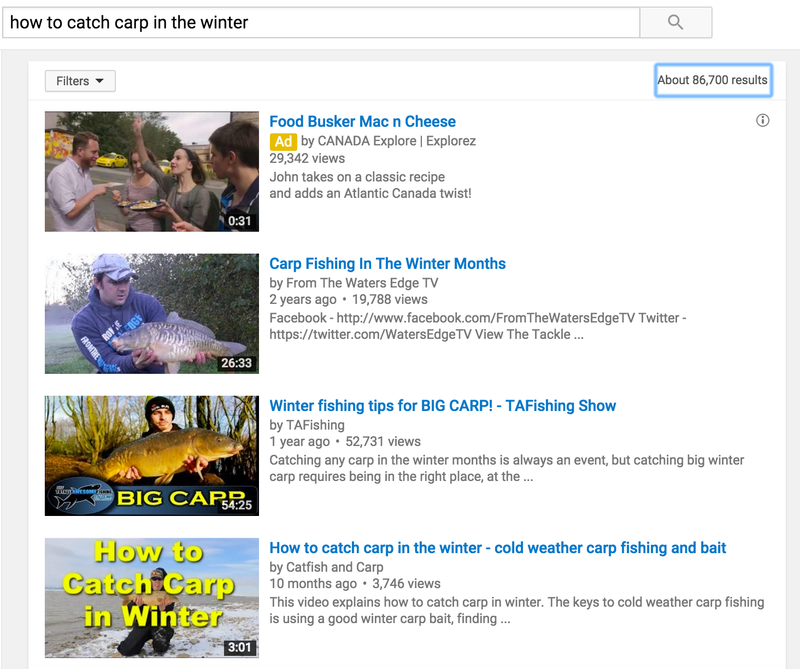 It is also worth considering that this is only using YouTube as the platform for finding content angles, and dedicated angling forums can produce some very good content ideas. So when the videos are live on YouTube and generating a lot of interest, how can we best leverage this to improve the SEO performance of the site, referral traffic from YouTube and the conversion rate of the website’s landing pages? With all the new-found interest generated through the YouTube videos, it is time to utilise this for more sales. If your videos address queries then they may well be ranking organically in Google as a video result, which will take people to the YouTube video. It is important to give the viewer of the video a clear direction that will lead them to the site (once you have solved their problem in the video). This can be achieved by letting them know where they can purchase the product and including the product link in the video description, or directing them to a blog post where the process is broken down with step by step images and description, where you will guide them to the product page. This breakdown with images could be a really useful additional resource for anglers who are lakeside on a mobile phone and don’t want to keep skipping back and forth through the YouTube video. Korda have utilised self hosted video on the “Fake Food” category of their site, as well as on the specific fake food product pages like the “pop-up corn”. This allows visitors to absorb highly relevant video content without being led onto a competitor’s YouTube video, which is what happens if you simply put your YouTube video on the webpage. With the above approach, not only will you have a stream of a high quality referral traffic from YouTube, you will also have the ability to get specific landing pages on your site to rank better in Google. 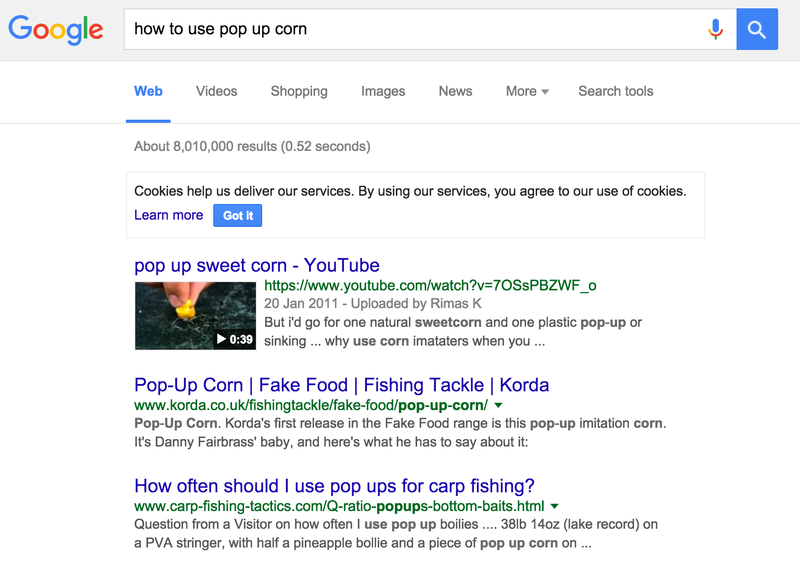 To illustrate this I have shown the SERPs in Google for “how to use pop up corn” and you can see Korda’s desired landing page ranking organically at position 2.
because you are being found for a wide array of searches. As shown below, Korda are being linked to from fishing blogs such as tightlines.org.uk as well as universities that offer specialist fish management courses. SEO for Ecommerce: Do the Big Shopping Carts Get It Right? Google Plus Local – How to Get Verified Quickly! Worried about losing real estate and visibility in SERPs? Check out the Google SERP Features tool to find out which SERP features get supreme turf these days. It's free!